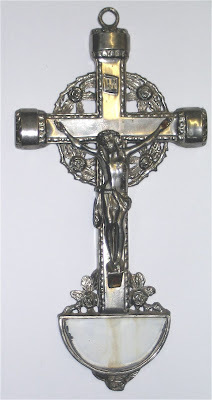 I BOUGHT THIS GERMAN CRUCIFIX IN ABOUT 2006. A GREAT EXAMPLE EXCEPT IT'S MISSING THE GLASS FONT AT THE BASE. I'M ON THE LOOK OUT FOR ONE, BUT KIND OF A RARE OBJECT TO FIND ON ITS OWN.